Below we list some of our favourite events and partners, do visit them too. Music at Paxton was established in 2006 to present high quality performances of chamber music at Paxton House. Over the past decade the festival has grown to a ten-day summer festival, bringing international artists to the Scottish Borders such as Alasdair Beatson, Adrian Brendel, Mahan Esfahani, Joanna MacGregor, Alina Ibragimova and Cedric Tiberghien, Steven Osborne, Pascal Rogé, the Doric, Carducci, St Petersburg, Edinburgh Endellion and Heath Quartets, the Primrose and Frith Piano Quartets, Scottish Ensemble, Avison and Hebrides Ensembles, James Baillieu and the Scottish Flute Trio. Concerts are held in the stunning Picture Gallery, an intimate venue seating 140. 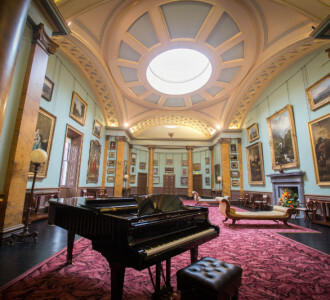 With its wonderful acoustics, domed roof-light that lets in the summer sun and walls hung high with paintings from the National Galleries of Scotland’s collection, it is an idyllic setting for chamber music. The 2018/2019 season at Kelso Music Society has a wonderful line-up of players, starting with the world famous cellist Raphael Wallfisch and pianist John York, then a return visit by the amazing Suntory Award winning Yu Kosuge. The Aronowitz Ensemble and the SCO Winds, both very starry groups of musicians, are followed by Sean Shibe, winner of the 2018 RPS Junior Award and now a BBC New Generation Artist. Then we have the Zemlinsky Quartet from Prague with an all Czech programme, and finally Richard Uttley a brilliant young ex-YCAT pianist. Every year since its founding in 1962 the Society has presented a season of chamber concerts, running from September to March, performed by artists of national and international renown. Some of the visiting musicians are young performers in the early stages of their professional career, while others have well-established reputations. The Society also likes to encourage home-grown talent from Scotland. The concerts and recitals take place in Melrose Parish Church Hall.